This boot is Italian made, using premium, full-grain leather for the uppers along with a microfiber in front for comfort. The plastic buckles provide a snug fit for any foot. 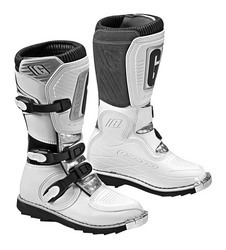 Safety features include a kick plate on the front of the sole, a heavy-duty leather heat shield, an injection-molded heel for a snug fit, and a durable shin plate. Available in two color styles: Carbon on white, and White on Carbon.